Renewal of a man's nature by casting aside the impurity of sin which cleaves to him from his former life, thus turning him into a pious and righteous child of God. The idea of man's regeneration was first expressed by the prophet Ezekiel (xxxvi. 25 et seq. ; compare xi. 19, xviii. 31; Ps. li. 12): "I will sprinkle clean water upon you; from all your filthiness and from all your idols will I cleanse you, and I will give you a new heart, and a new spirit will I put within you." It was probably suggested by the rite of ablution, which was connected with every conversion (see Zech. xiii. 1 et seq. and Isa. iv. 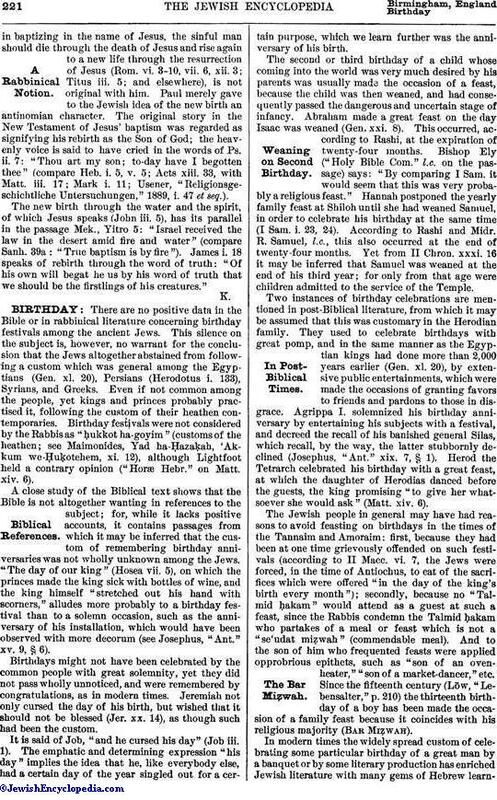 4; compare "Shibbole ha-Leḳeṭ," p. 145a, quoted by Schechter, in "Jew. Quart. Rev." xii. 421) and signified a change of the whole man; exactly as Naaman the proselyte, after bathing in the Jordan seven times, became clean "and his flesh like that of a little child" (II Kings v. 14). The expression used by the Rabbis for the person who underwent a change of heart through repentance and conversion is, therefore, "beriah ḥadashah" (a new creature). The verse, "The people which shall be created shall praise the Lord" (Ps. cii. 19 ), is explained in Midr. Teh. on the passage (compare Pesiḳ. d. R.K. xxviii. 181) thus: "The people who shall be reborn through repentance of their sins shall praise the Lord"; and it is either referred to the Messianic future, "the generation to come," or to the annual regeneration on the Day of Atonement, which, by blotting out the old year's sins, renders Sukkot "the first day" "of the reckoning of sins" (Tan. and Lev. R. to Lev. xxiii. 40). The proselyte who casts off the impurity of idolatry and turns to the God of life becomes a "new creature" (Gen. R. xxxix. ; Soṭah 12b; compare Asenath, Prayer of). "He who turns away from uncircumcision and becomes a Jew is like one who turns away from the grave and requires cleansing," was the maxim of the Hillelites (Pes. viii. 8). 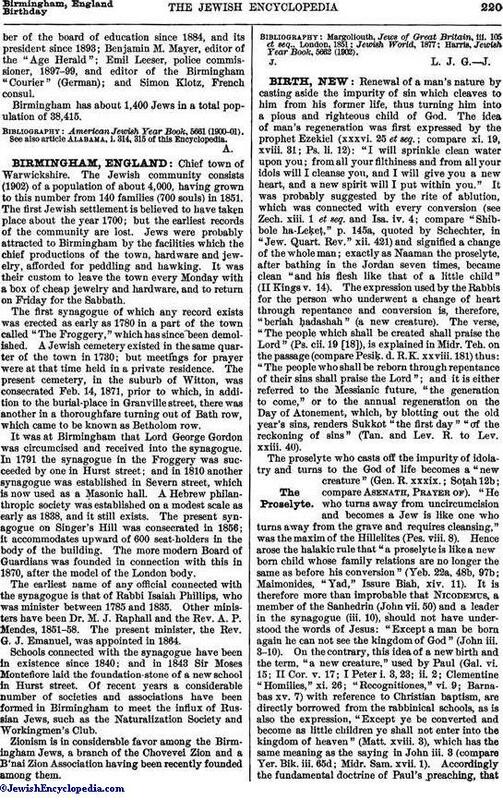 Hence arose the halakic rule that "a proselyte is like a new-born child whose family relations are no longer the same as before his conversion" (Yeb. 22a, 48b, 97b; Maimonides, "Yad," Issure Biah, xiv. 11). It is therefore more than improbable that Nicodemus, a member of the Sanhedrin (John vii. 50) and a leader in the synagogue (iii. 10), should not have understood the words of Jesus: "Except a man be born again he can not see the kingdom of God" (John iii. 3-10). On the contrary, this idea of a new birth and the term, "a new creature," used by Paul (Gal. vi. 15; II Cor. v. 17; I Peter i. 3, 23; ii. 2; Clementine "Homilies," xi. 26; "Recognitiones," vi. 9; Barnabas xv. 7) with reference to Christian baptism, are directly borrowed from the rabbinical schools, as is also the expression, "Except ye be converted and become as little children ye shall not enter into the kingdom of heaven" (Matt. xviii. 3), which has the same meaning as the saying in John iii. 3 (compare Yer. Bik. iii. 65d; Midr. Sam. xvii. 1). Accordingly the fundamental doctrine of Paul's preaching, thatin baptizing in the name of Jesus, the sinful man should die through the death of Jesus and rise again to a new life through the resurrection of Jesus (Rom. vi. 3-10, vii. 6, xii. 3; Titus iii. 5; and elsewhere), is not original with him. Paul merely gave to the Jewish idea of the new birth an antinomian character. The original story in the New Testament of Jesus' baptism was regarded as signifying his rebirth as the Son of God; the heavenly voice is said to have cried in the words of Ps. ii. 7: "Thou art my son; to-day have I begotten thee" (compare Heb. i. 5, v. 5; Acts xiii. 33, with Matt. iii. 17; Mark i. 11; Usener, "Religionsge-schichtliche Untersuchungen," 1889, i. 47 et seq.). The new birth through the water and the spirit, of which Jesus speaks (John iii. 5), has its parallel in the passage Mek., Yitro 5: "Israel received the law in the desert amid fire and water" (compare Sanh. 39a: "True baptism is by fire"). James i. 18 speaks of rebirth through the word of truth: "Of his own will begat he us by his word of truth that we should be the firstlings of his creatures."